Jack is evil, soulless, and won't stay dead when killed. 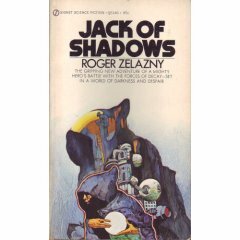 Few authors could handle writing such a character, although Roger Zelazny handles it excellently. In "Jack of Shadows," he tells the story of Jack. He is killed within the first few pages and comes back seeking revenge. He gets it, but it comes at cost that might destroy the world. As he often does, Zelazny creates a world that few others could match for imagination. The world has two halves: one in eternal darkness where magic rules, the other side in eternal light and technology is king. Those born in light have souls and live but one life, while those born in darkness have many lives to spend before they die yet they have no souls. In the center of the world, there is a 'thing' that keeps the world from spinning. I say thing because the lightsiders think it is a demon and the darksiders think it is a machine. Jack wonders what the true nature of reality is at one point, but never learns the answer. In many ways this felt like a brief lesson in quantum mechanics where it is confusing as to whether 'things' are particles or waves. This book has a lot in common with the Amber series. The 'hero'--and I use the term loosely--is an immortal, he's an antihero, and the world is split into two parts. However, Corwin of Amber is a (somewhat) likeable guy. while Jack is almost completely evil until the last few pages of the book. Corwin spends several years in a prison, while Jack only spends what feels like a couple weeks. Although Jack's prison is more interesting, it felt underutilized. The Amber series is long and well developed, whereas this book is short; the last half of it felt rushed. There are several ideas presented in the beginning of this book, like Jack being able to hear his name if it is spoken in shadow; an ability that is not important in the slightest anywhere in the book. There are a few lyrical passages characteristic of Zelazny, but they are few and far between. Most occur early on. All that said, there are quite a few positive parts of this book. The resolution of the character's problem is satisfying, as is that of the world's problem. The book is filled with interesting ideas as well as encounters with unusual monsters and characters. If you are a fan of Roger Zelazny or want to relive the Amber books, I heartily recommend this book. If you are unfamiliar with him, I'd recommend starting with "Lords of Light" or "The Great Book of Amber."